Our Friday morning excursion took us to the Lincoln Homestead State Park, and the Mordecai Lincoln Home. Mordecai was the brother of Thomas Lincoln, Abraham’s father. We also visited the Richard Berry House, where Thomas Lincoln and Nancy Hanks were married on June 12, 1806. Richard Berry signed the Lincoln – Hanks Marriage License as the guardian of Nancy Hanks. 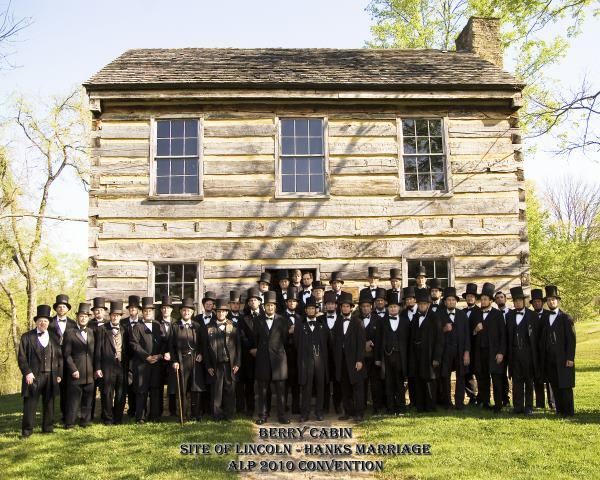 While at these sites we toured replica buildings, and viewed many items of period furniture, and documents related to the marriage of Thomas and Nancy Lincoln. There were other period home furnishings such as a spinning wheel. Noon found us enjoying lunch from Mordecai’s Famous Restaurant; the lunch was provided by Springfield City Hall. Immediately following our meal we conducted our Annual Business Meeting. We then traveled to the Washington County Courthouse in Springfield, Kentucky, which was built in 1816. Across the street from the old Courthouse we gathered around the Lincoln Statue for a group picture. In front of the old Courthouse numerous elementary students gathered to see this strange gathering of so many “Men in Tall Hats,” with ladies in period attire. On Saturday we toured historical places in Elizabethtown, before we traveled to Hodgenville, and the Lincoln Museum. Their displays gave the visitor additional perspective on Lincoln, and his times. While in Hodgenville, we were welcomed by Iris LaRue and the LaRue County Historical Group, who provided us a delicious lunch. Upon request, Iris shared some of their recipes with us. Following lunch we gathered around the Lincoln Statue for group photos. We then traveled the few additional miles to Sinking Spring Farm, Lincoln’s birthplace. We walked the trails, viewed the replica cabin, and visited the spring where “sister Sarah” fetched water for the cabin. We also reflected on the labor to build split rail fence as we observed the park fencing. Saturday evening was spent at a buffet dinner and period dance. On Sunday morning we were welcomed at the South Fork Baptist Church for worship services. Larry Elliot gave a short introduction, Chet Damron provided a message, and the Singing Lincolns provided some special music. After worship we enjoyed time speaking with congregants, and then enjoyed lunch before departing for our respective homes.